Early this morning the horns were tooting, the sirens sounding, and congestion settled on the streets like a fog. 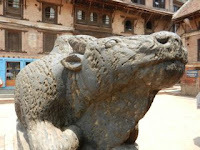 To walk along the street, probably 6-8 feet wide, you battle big time with motorcycles (there are 414,000 motorcycles in Kathmandu - at 1800 dollars a shot imported with a 220 per cent mark up from India, mostly) compact vehicles (versions of mini-mini-trucks) and people. They’d just as soon clip you as run over you, if you fail to heed the constant honking and whistling warnings, because speed reigns. A good hip swing helps you get along. Shop after shop (which opens onto the streets) is smack on the edge of the by-way. Don’t dare a glance at what is hanging in lawyers in the open front of the shop. I did and saw a Angry Bird cap - which I had to have for my Angry Bird genius grandson, 5. Really, you must concentrate on walking in an area the size of the Gymnastic balance beam. When you reach some sort of open plaza it is occupied by all sorts of strange Hindu temples splattered with red powder (symbol of love - a woman can wear red until her husband dies, then no more). Bulls, elephants, people are in statue form - some out of rock, some just darn tired seeking shelter under the eaves from the suffocating heat. As things rushed to normal in this city, I was able to have a tour guide named Ramesh and his diver squeeze us through the masses to a crafts compound called Jawalkhel where a few of the1000 Tibetan women refugees, in exile here since the Dali Lama fled Tibet in 1959, have some sort of employment (they normally are not hired) spinning wool from mountain sheep and weaving thick rugs on primitive looms. As we entered, each one bowed a greeting: Tashi-delek. 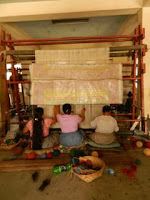 Most had their shoes off and sat on the floor pulling a part streams of wool and spinning by hand, not machine. On another floor were enormous primitive looms - fascinating - where other women wove giant rugs in not a whole bunch of light. 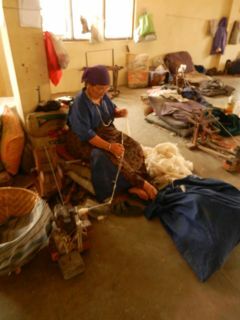 Red Cross and Switzerland have been backers of this enterprise for these sweet women. 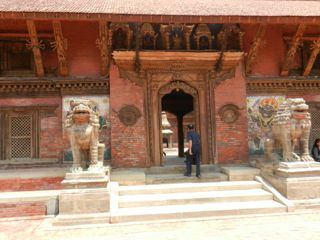 My guide was a wealth of information so when we went to the Museum behind the Golden Door known as the Patan Museum (Patan means beautiful city - welllll) he explained to me the basics of Hinduism (his religion) and Buddhism in a simple fashion. 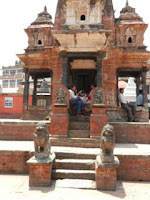 You step up and down over steps - so watch your step - and, as is common in Kathmandu, the lights were off so only light coming in from small windows under eaves helped me see anything. But I wasn’t giving up and Ramesh made it worthwhile. Hindu and Buddhist deities or holy men are Identified through the way they sit or stand, their clothing and ornament, and who or what accompanies them, the presence or absence of multiple heads and limbs, the positions of hands, the objects they hold, the colors involved, who is and what accompanies them. These attributes or cognizances are what make the icon. Being a student of our Christian Icons , it occurred to me how similar is our traditional icons of saints and God. How Jesus or Mary or a particular saint is posed, the robes worn, the hand positions, what object is included as symbol of the saint, and so much more from Byzantine times to now, is primarily what makes our Icons as well. Also the way the Hindu and Buddhist holy figures are presented were prescribed in ancient religious texts and images must be made accordingly as are our Icons. The diverse positions of hands (mudra) symbolize a range of emotions, conditions and situations - charity, reassurance, meditation, teaching, argument, etc. What the image holds in hands: shaft of grain, a book, a weapon, or other device, indicates their personality, functions and powers which identify them. Sound familiar? Ramesh said that although we think Hinduism has millions of gods, there are only three major aspects of god: 1) Brahma, creator of the universe; 2) Vishnu, the protector of the creation, and 3) Shiva - god of destruction and also recreation. He destroys and rebirths and this is why cremation is important. You have to destroy a body to have karma and reincarnation. This too reminded me of our Christian Trinity - the creator, the protector (possibly the Holy Spirit) and the destruction-recreation which could be compared to Jesus who came to die on the cross to eliminate all the evil in the world and sin, then resurrected to be the new creation. A dead seed must be planted to produce something beautiful. The image of a god with four faces - Shiva Linga - is the god of gods who has thousands of heads. He is inexplicable and all beyond thought. There are 33 million gods and goddesses in Hinduism (or other manifestations and reincarnations of the three principle ones.) To get all the details of each metal figure would cost a life of doing nothing else but. ANOTHER INTERESTING DAY WITH YOU IN KATHMANDU. TRAVELING WITH YOU VIA YOUR BLOG IS EXCITING. WE MISS YOU. PRAYING FOR YOU.